In our age of rapidly changing habits, more people use other devices than a classic PC or laptop to surf the net. Therefore, it was necessary to adapt certain pages of our site to the different platforms used (tablets, mobile phones, ...). This is now complete and the site is released. If you have problems seeing the site as you should, please let us know, providing a maximum of info: device, OS, page, issue, ... You can always let us know via our contact form. Thanks for your help and enjoy the new site and new possibilities! IIBLC® passed another important milestone: 1000th CGBL® ! On Thursday July 23rd, during a small gathering in Breda (NL), IIBLC® president Luc Van Landeghem has presented the 1000th CGBL® Certified Green Belt in Lean certificate to Ms Patricia van Wanrooij. Ms van Wanrooij passed the CGBL® exam during the June sesion with a high score of 92%! She is currently employed by Eiffel with head-office in Arnhem (NL). We congratulate Ms van Wanrooij (and all other candidates that succesfully passed their exam) and hope to see the next milestone soon. The exam dates for the different levels are now available on this site. Check the Lean Certification page or go to the appropriate page for any given level. Hilde Rombouts (from Milvus.cz) published a pulse on LinkedIn with an interview of Veronique concerning her IIBLC® certifications. To read the pulse, click here. As from today, MILVUS will act as the official exam centre for IIBLC® in the Czech Republic. Exams will take place in Prague. We are very happy to welcome the MILVUS team in our community and wish them and their candidates all the best of luck! This week, IIBLC® and aChain from Brazil have engaged in a partnership that allowes aChain to act as partner/exam centre for Brazil. We welcome them to our Lean certification community. You can find their details on the education/exam centre page of the site. The first CChL® Certified Champion in Lean in France has been awarded to Mr. Xavier Perrin of XP Consulting. Congratulations to him and welcome in the elite class of our Lean community! First exams will be passed on December, 14th. We welcome our new exam centre in our Lean community and wish them and their candidates all the best of luck! During the Supply Chain Innovations event at Lint, Belgium, Luc Van Landeghem, president of IIBLC®, presented Mr. Wim Anthierens the certificate of CChL® Certified Champion in Lean, in presence of Mr. Willy Van Overschée, CEO of CIMCIL, the Belgian exam centre. Mr. Anthierens is the Coach Logistics and Continuous Improvement Processes at Atlas Copco Airpower NV, Industrial Air Division in Wilrijk, Belgium. This makes him the second Certified Champiion in Lean for Belgium. IIBLC® is adding new exam locations for candidates: Munich, Berlin, Vienna and Zurich. 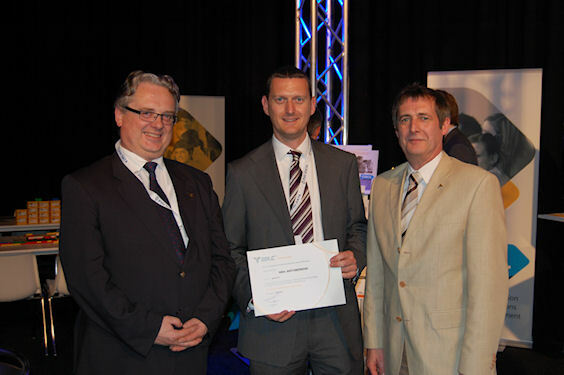 This thanks to our new exam centre: PMI Production Management Institute GmbH in Planegg (Munich) Germany. Please check out the details of the new exam centre at our exam/education centre page of the site.